Pull request Compare This branch is 50 commits behind ga-wdi-boston:master. Initialize a git repository in order to track changes. Create a new branch to isolate your changes. 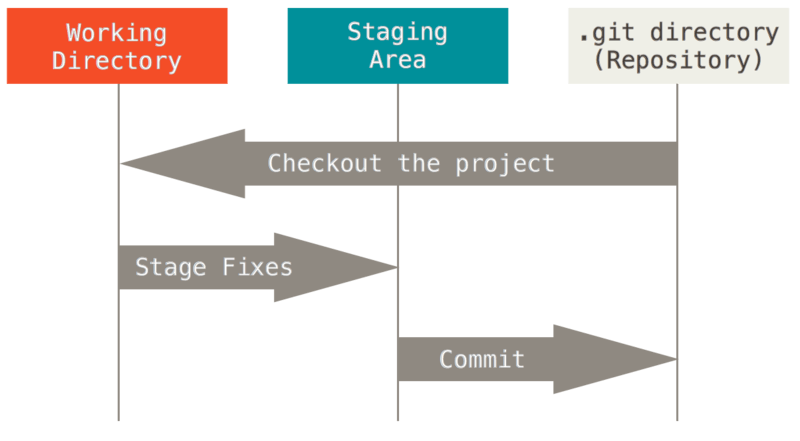 Place new or changed files into the staging area to prepare them for a commit. Remove files from the staging area before a commit. Commit new and changed files to a git repository. Version control! As developers our code is our livelihood so it's important that we safely store our work... frequently. Not only that we want to track our changes as we make them. If we make a feature that ends up breaking the rest of our app we want to be able to go back to a point when our app was last working. Let's initalize a local repository. In your training directory create a subdirectory called game-of-gits. Inside of the game-of-gits directory create a file called sad-tale.md. Regent. He is surely honorable and will lead a long and prosperous life. Inside of the game-of-gits directory type git status. Did anything happen? Again, inside the game-of-gits directory type git init. Type git status again. Did anything happen this time? Using git add <"name_of_file"> we are going to add our story to the staging area. There are 3 states that your file can reside in committed, modified and staged. These states map to the different sections of a Git project. Modified means that you have changed the file but have not committed it to your database yet. Staged means that you have marked a modified file in its current version to go into your next commit snapshot. Committed means that the data is safely stored in your local database. When we add a file we are moving it from the working directory to the staging area. When you use -m to create an inline commit you are doing yourself and others a disservice. Your commit will be inherently poor due to the short nature of inline commits, and the lack of a body description to it. This is surely a sign of a poor developer and one that does not respect his or her teammate's time. Read over the following blog posts and carefully think about what a good commit message would be. Take some time to come up with your own. Be ready to share your commit with the rest of the class. What's in a Good Commit? Now that we've made our first commit, let's see what happens when we type git log... We see our previous commit! This typically shows all of our previous commits, but since we just have one, that's all we see. Feel free to play around with options for git log, like --oneline, --name-status, and --graph for example. For all options click here. Together, let's continue our story. happily ever after... He definitely didn't get axe murdered. Now using what we learned earlier stage this change. To figure out the status of your files you can type git status in the terminal at any time. It turns out Ned actually did get axe murdered. So we probably want to unstage our file. Delete the last thing we wrote in sad-tale.md. We know that Ned's story doesn't have a happy ending but let's dream big. We're going to create a dream-story branch and write what we would have wanted to happen. Inside of game-of-gits create a file called the-stark-bunch.md. Type This is a story... of a man named Neddy... and three very badass really awesome girls. What's the difference? What is actually happening with the rm command? Similar to having one main story and various sub-plots--a branch lets us effectively duplicate and section off the code we have writte thus far, make alterations to it, and if we would like at some point we can join it back to the main branch (typically called master). Create a branch called dream-story by typing git branch dream-story. You can see all your current branches at any time by tying git branch. Now that we've created our branch--in order to use it we have to switch to it. We can do this with the command git checkout <"branch_name">. 1.Switch to your dream-story branch and write a brief description of what you would have wanted to happen to Ned. 2.Save the file, Stage and commit your changes. 3.Switch back to your master branch. (Notice anything?) Add what really happened to Ned. 4.Stage and commit your changes. (Be ready to talk about any issues you many have encountered or strange things you may have noticed). Now let's take 10-15 minutes and go through Learn Git Branching together. NEVER use git add . NEVER use git commit -m "an example commit message"